If you are fortunate enough to stumble across a large, grey-brown or tan mushroom with clusters that resemble the florets of cauliflower under the base of a very large and old Oak tree, call me! It could be a hen of the woods! Grifola frondos is a polypore mushroom that grows in clusters at the base of trees, in particular oak trees. Commonly called hen of the woods among English speaking folks, it is also known as ram’s head and sheep’s head. 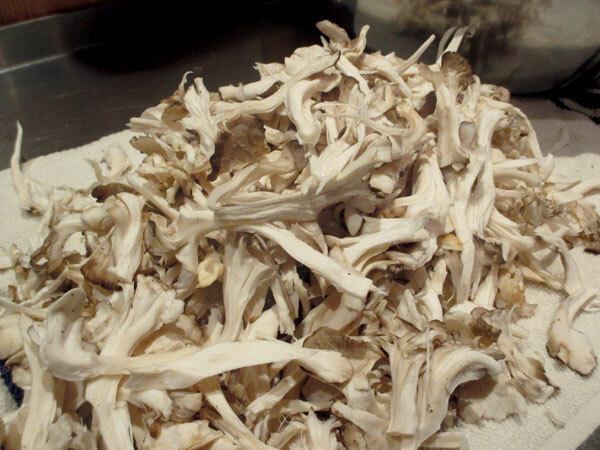 The fungi, native to China, North America, and the northeastern part of Japan is available in Asian markets as “maitake”. 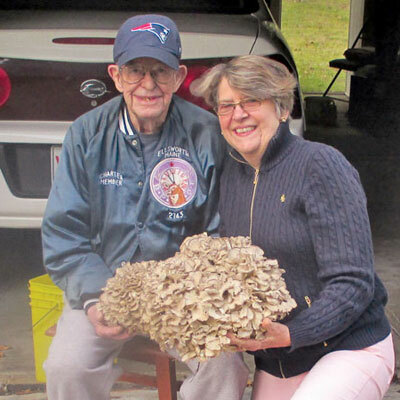 Prized in Asian cuisines because of its medicinal qualities, maitake mushrooms are now being cultivated here in Maine. Research indicates that this fungus is packed with antioxidants, combats diabetes, high blood pressure, and high cholesterol. And best of all, maitake mushrooms add a boost to the immune system, just when the fall cold and flu season starts. Another great reason to eat local! 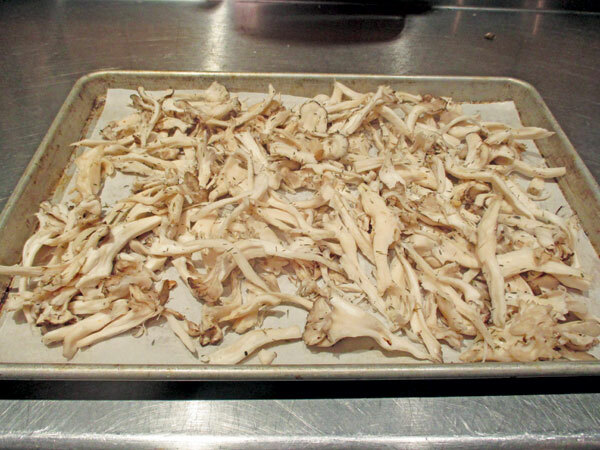 Health benefits aside, we love hen of the woods mushrooms because they taste good. The flavors are earthy, meaty and spicy. During cooking, the fronds absorb even more flavor. 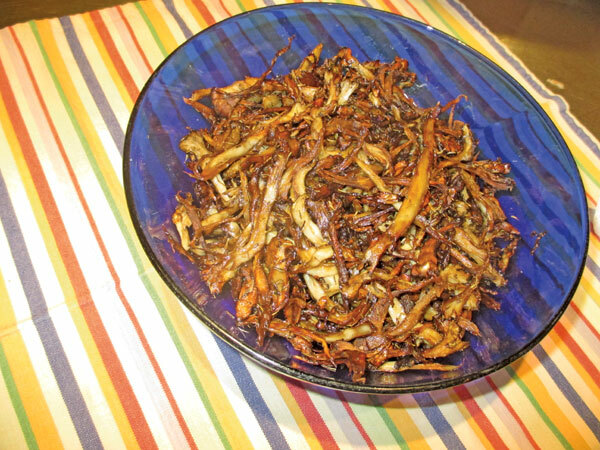 We enjoy maitake sautéed in butter and garlic, or slathered with oil and herbs and grilled. 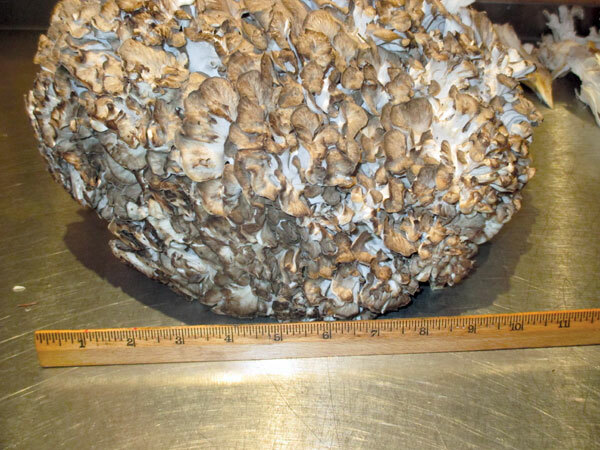 Once harvested, hen of the woods will store in the refrigerator for several weeks in a closed container. This year my foraging yielded 6 mushrooms weighing in at over 34 pounds. With such a bounty, I’ve been trialing methods to preserve my hens to enjoy in the winter. 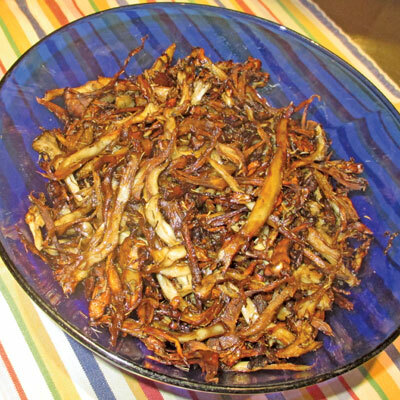 Although drying is always an option, seasoning and roasting the shredded pieces in a 300-degree oven was a big hit. The first time we gobbled up bowls of the crisp, brown nuggets as an appetizer. Think of them like crispy onion rings, only better. Delicious on a burger, crunchy in a salad, tasty as a topping for a creamy mushroom soup, roasted hen of the woods or the cultivated variety maitake have no equal. Preheat the oven to 300 degrees. If your oven has a convection mode, use the convection setting. Line a sheet pan with parchment paper. Clean the tough stems from the bottom of the mushrooms. If working with a foraged mushroom, rip the mushroom apart, checking carefully for bugs, centipedes, fir needles and other contaminants. If need, rinse thoroughly. 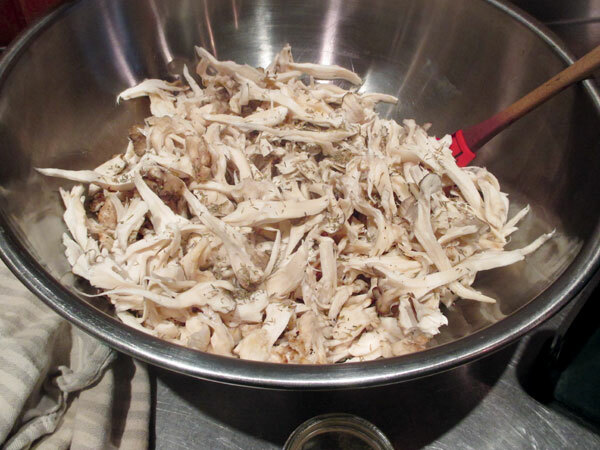 Using your hands, rip the mushroom apart into shreds into a large bowl. Cut the tough stem pieces off and set aside to make mushroom stock. Pour the oil over the mushroom pieces and add the dried thyme. Mix well. Place the oiled and shredded mushroom on the sheet pan. Roast until the mushroom is golden brown and crisp around the edges, about 50 – 60 minutes. Remove from the pan back into the large bowl. Season to taste with sea salt and fresh pepper. Serve as a side dish, on top of burgers, as part of a salad, or add to your favorite recipe that uses mushrooms. Nutritional analysis per serving (varies): 123 calories, 2.4 grams protein, 3 grams carbohydrates, 11.5 grams fat, 30 mg. sodium, 1 gram fiber. * No Hen of the Woods? This recipe will also work with other meaty mushrooms like large Portobello caps and shiitakes. Cultivated mushrooms are available at your local health food store or coop or farmers market.